Written by Felipe Azenha & filed in Arts, Community, Events. WHO: The Adrienne Arsht Center for Performing Arts of Miami-Dade County’s Green Room Society (GRS). GRS is a group of social influencers who serve as ambassadors and philanthropic supporters for the Arsht Center and who are engaged as active leaders in Miami’s arts community. 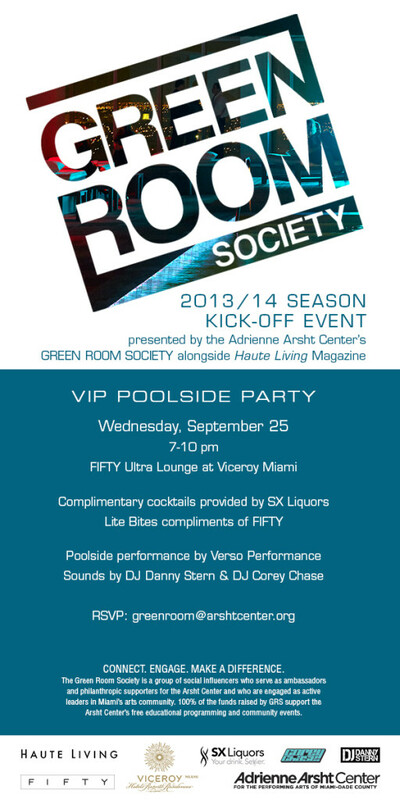 WHAT: The Adrienne Arsht Center’s Green Room Society (GRS) is launching its 2013-14 season with a VIP rooftop event hosted alongside Haute Living Magazine. 100 percent of the funds raised by GRS support the Arsht Center’s free educational programming and community events. The GRS kick-off event at FIFTY Ultra Lounge Miami will feature a poolside performance by synchronized swimming group Verso Performance and sounds by DJ Danny Stern and DJ Corey Chase. Enjoy light bites by FIFTY Ultra Lounge and complimentary cocktails provided by SX Liquors.